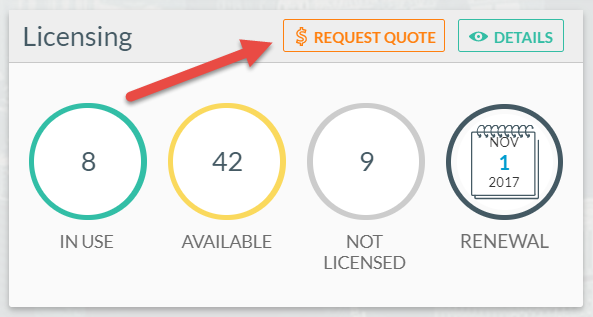 CiraSync now has the ability to add licenses to an enterprise edition subscription. When adding seats, you can have a single subscription to renew each year. The minimum CiraSync subscription allows you to Sync the GAL, Public Folder contacts and shared calendars for ten Outlook or smartphone users. Using the CiraSync dashboard, you can purchase a subscription, or you can get a hard copy sales quote to hand to your manager. This capability is located on a tile directly in the center of the dashboard. If you want to go directly to a purchase, hit the Buy it Now button (2). Otherwise, please proceed to email the quote (1). We had a customer that hired 50 interns for the summer. They wanted a subscription for these users starting June 1 for three months. In this case, they were adding seats to their primary subscription and they did not need to align the expiration. If you have a similar need, choose Buy a new license from the choices above. If you need to add seats to your existing subscription, you can now avoid having two expiration dates. When you added seats in the past, seats would expire on the date of your original subscription, and also a second subscription that usually would end one year from the second purchase date. You probably do not like the idea of having to renew subscriptions several times per year. There is a solution now! In this case we want to choose Add Seats to existing license as shown above and you will see a dialog asking that you choose the number of ten packs you want to purchase. If you proceed to the next step and actually make a purchase, whatever amount is calculated would be the exact amount your credit card would be charged. Alternatively if you get a quote today but actually purchase next week, the price will be lower as there are fewer days left in your original subscription. If you have any problems making a purchase, contact Cirasync support and someone can setup a screen sharing session to resolve your issue quickly.